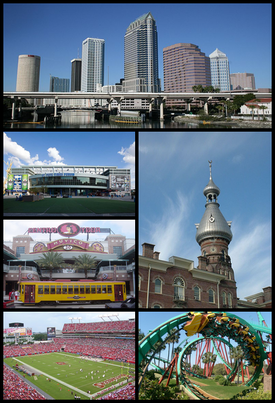 Tampa /ˈtæmpə/ is a city in and the county seat of Hillsborough County, Florida, United States. It is located on the west coast of Florida on Tampa Bay, near the Gulf of Mexico, and is part of the Tampa Bay Metropolitan Area. The city had a population of 358,699 in 2014. In 1824, the United States Army established a frontier outpost called Fort Brooke at the mouth of the Hillsborough River, near the site of today’s Tampa Convention Center. The first civilian residents were pioneers who settled near the fort for protection from the nearby Seminole population, and the small village was first incorporated as “Tampa” in 1849. The town grew slowly until the 1880s, when railroad links, the discovery of phosphate, and the arrival of the cigar industry jump-started its development, helping it to grow from a quiet village of less than 800 residents in 1880 to a bustling city of over 30,000 by the early 1900s. Today, Tampa is part of the metropolitan area most commonly referred to as the “Tampa Bay Area”. For U.S. Census purposes, Tampa is part of the Tampa-St. Petersburg-Clearwater, Florida Metropolitan Statistical Area. The four-county area is composed of roughly 2.9 million residents, making it the second largest metropolitan statistical area (MSA) in the state, and the fourth largest in the Southeastern United States, behind Miami, Washington, D.C. and Atlanta. The Greater Tampa Bay area has over 4 million residents and generally includes the Tampa and Sarasota metro areas. The Tampa Bay Partnership and U.S. Census data showed an average annual growth of 2.47 percent, or a gain of approximately 97,000 residents per year. Between 2000 and 2006, the Greater Tampa Bay Market experienced a combined growth rate of 14.8 percent, growing from 3.4 million to 3.9 million and hitting the 4 million population mark on April 1, 2007. A 2012 estimate shows the Tampa Bay area population to have 4,310,524 people and a 2017 projection of 4,536,854 people. Tampa was ranked as the 5th best outdoor city by Forbes in 2008. Tampa also ranks as the fifth most popular American city, based on where people want to live, according to a 2009 Pew Research Center study. A 2004 survey by the NYU newspaper Washington Square News ranked Tampa as a top city for “twenty-somethings.” Tampa is ranked as a “Gamma+” world city by Loughborough University, ranked alongside other world cities such as Phoenix, Charlotte, Rotterdam, and Santo Domingo.